We did exceptionally well last month in terms of sales and so HQ approved our application to have a staff dinner on Ah Kong's account. 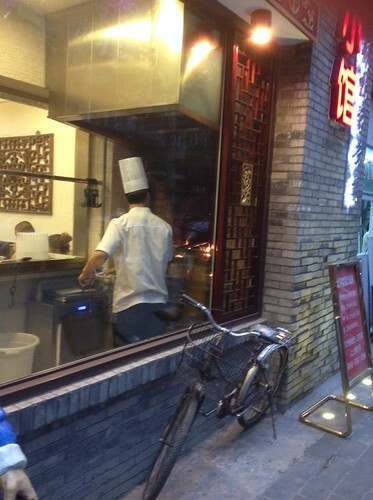 We went to this 老北京 restaurant where they served pretty awesome Peking Duck. The place is relatively inexpensive that a Peking Duck is RMB 128 (which is about SGD 25.60). We ordered 2 ducks for a table of 11 people. In Singapore, I am used to putting the roasted duck skin along with shredded spring onions and other condiments inside the "tortilla" or popiah skin. Over here, the skin itself is served as a dish for you to eat directly which I felt was a tad too oily to eat on its own. Instead, it was the duck meat that goes into the tortilla. 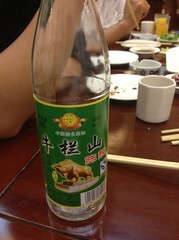 As per Chinese custom, no dinner is complete without alcohol. When in Rome, do what the Romans do they say and so my staff ordered NiuLanShan (when I pick the bottle up, does it mean I kio tio gu lan?). That bottle of spirit, which was selling at RMB 18.00 (SGD 3.60) in the restaurant, was 42% alcohol and despite its very humble price tag, it wasn't as rough as I originally expected. It, surprisingly, was quite tasty but the smell is something that one needs time to get used to. We then ordered beer to wash down the dinner later but we hung around so late that the restaurant had no choice but the dim the lights to hint to us that they are closing. Hope we continue to chalked good sales numbers in months to come so that we can have more of these dinners.